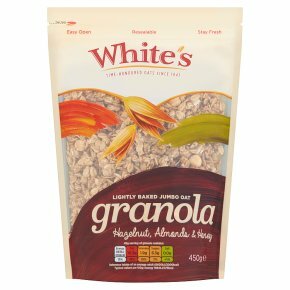 Suitablefor vegetarians.We're always thinking about how to make the most of our precious White's oats. By lightly baking them in honey with pumpkin seeds, sunflower seeds and golden linseed and then adding almonds and hazelnuts we've created a granola of sublime taste and texture. Enjoy as a crunchy cereal or as a delicious topping with yoghurt.